After a cold and seemingly endless winter, residents of Wisconsin welcome the first flowering trees of spring. A multitude of fruit trees that grow in Wisconsin present early spring blossoms, including dozens of varieties of apple trees, plum, cherry, crabapple and pear trees. The countryside is resplendent in early spring, offering the flowers of native trees, including several varieties of maple trees, lilacs and elderberry trees. Forsythia is one of the first small trees to bloom in Wisconsin. Examine the flowers of tree and shrubs. 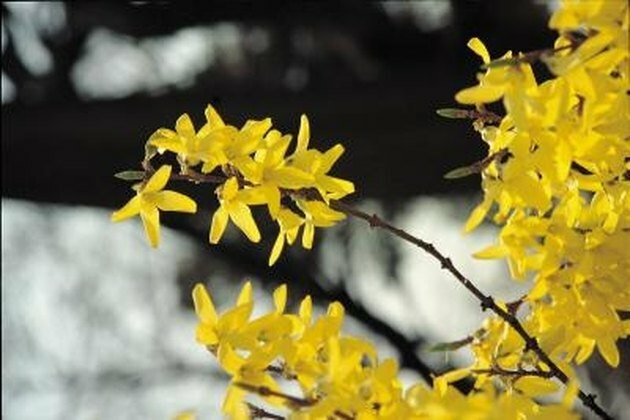 Native to Wisconsin, forsythia is one of the earliest plants to bloom. Flowers are often evident in late March. Covered with brilliant yellow flowers, the plant adds color and visual interest to urban landscape and country gardens. There are several varieties of forsythia. Some are low-growing dwarf shrubs that only grow 1 to 2 feet tall. Others are large shrubs or small trees, reaching heights of over 25 to 30 feet at maturity. White forsythia (Abeliophyllum distichum) has similar growing requirements to yellow forsythia but presents cascades of bright white flowers in early spring. Study the native habitat of wild plants native to Wisconsin. Dwarf honeysuckle (Diervilla lonicera) can be found in roadside ditches, along fence lines are gracing rural gardens. Presenting yellow flowers and a sweet scent, Dwarf honeysuckle grows anywhere that has full sun, lots of moisture and fertile soil. Look at the buds of the tree. Silver maple (Acer saccharinum L.) is the earliest flowering tree in Wisconsin. At the tips of the red and black buds, the tree presents tiny white and pink tinged flowers. Silver maple is one of the most plentiful trees in Wisconsin and offers shade and silvered foliage that turns brilliant shades or yellow, orange and red in autumn. Search for early spring roses. the Scotch rose (Rosa pimpinellifolia) normally flowers in early June, however, depending on the severity of the winter, yellow, white or pink flowers may appear from May through July. The Scotch rose grows from 3 to 5 feet tall and is contained by pruning in the fall. Serviceberry (Amelanchier canadensis) offers white flowers early in the spring. Native to Wisconsin, serviceberry trees grow in abundance on the edge of dense forests, along streams beds, ponds, lakes and in roadside ditches. The dark purple berries that mature in June provide food for birds and wildlife.